The study design included a multidisciplinary examination of the mineral phase of ovine intervertebral disc calcifications. The objective of the study was to investigate the mineral phase and its mechanisms of formation/association with degeneration in a naturally occurring animal model of disc calcification. The aetiology of dystrophic disc calcification in adult humans is unknown, but occurs as a well-described clinical disorder with hydroxyapatite as the single mineral phase. Comparable but age-related pathology in the sheep could serve as a model for the human disorder. Lumbar intervertebral discs (n = 134) of adult sheep of age 6 years (n = 4), 8 years (n = 12) and 11 years (n = 2) were evaluated using radiography, morphology, scanning and transmission electron microscopy, energy dispersive X-ray spectroscopy, X-ray powder diffraction, histology, immunohistology and proteoglycan analysis. Half of the 6-year, 84% of the 8-year and 86% of the 11-year-old discs had calcific deposits. These were not well delineated by plain radiography. They were either: (a) punctate deposits in the outer annulus, (b) diffuse deposits in the transitional zone or inner annulus fibrosus with occasional deposits in the nucleus, or (c) large deposits in the transitional zone extending variably into the nucleus. 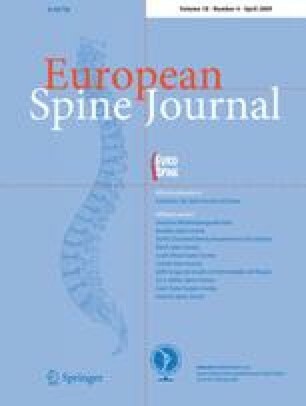 Their maximal incidence was in the lower lumbar discs (L4/5–L6/7) with no calcification seen in the lumbosacral or lower thoracic discs. All deposits were hydroxyapatite with large crystallite sizes (800–1,300 Å) compared to cortical bone (300–600 Å). No type X-collagen, osteopontin or osteonectin were detected in calcific deposits, although positive staining for bone sialoprotein was evident. Calcified discs had less proteoglycan of smaller hydrodynamic size than non-calcified discs. Disc calcification in ageing sheep is due to hydroxyapatite deposition. The variable, but large, crystal size and lack of protein markers indicate that this does not occur by an endochondral ossification-like process. The decrease in disc proteoglycan content and size suggests that calcification may precede or predispose to disc degeneration in ageing sheep. Ms Susan Smith is thanked for undertaking the histology and immunolocalisations used in this study. Dr Larry Fisher, National Institutes of Health, National Institute of Dental Care and Research, Bethesda, USA is thanked for the generous gifts of antibodies to bone sialoprotein, osteopontin and osteonectin. This study was funded by: the Sir Charles Cutler Memorial Fund, Institute of Bone and Joint Research, University of Sydney, Royal North Shore Hospital; Medtronics Australia and NHMRC project Grant 352562.